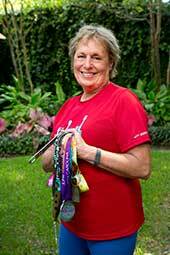 On May 8, 2011, at the age of 65, Sharron Ayers made a pledge to run a half marathon in every U.S. state. Considering the fact that Sharron was new to running and had never run a race until just a few months earlier, that pledge could easily be dismissed as little more than wishful thinking. Only four years later, at the age of 70, she’s almost halfway through her goal, having completed half marathons in 22 states. Brimming with energy and enthusiasm, and thrilled by the thought of traveling to races all over the country, Sharron’s only uncertainty is whether to add all 10 Canadian provinces to her pledge. The impetus for Sharron’s grand tour was nothing more than a simple walk before dinner around her St. Francisville neighborhood. Pleasantly surprised by the enhanced sense of vitality she felt afterwards, she decided to make it a daily event. Her daily walks soon became jobs and it wasn’t long before her naturally competitive streak took over and she found herself at the starting line of a half marathon in San Francisco. Sharron admits that racing was tougher than expected and she considered quitting more than once. In the end, it was years of life experience that carried Sharron across the finish line. It wasn’t a sudden burst of energy or inspiration from the cheering spectators. Instead, it was the self-awareness she developed over so many years that motivated her and would not allow her to quit. No one is immune to failure. We’ve all set goals and started projects that we abandon once we find they’re more difficult than expected. We learn from our mistakes, however, and years of life experience can give us a clearer sense of our capabilities and how high we can realistically raise the bar. And life experience taught Sharron Ayers that her bar can be raised pretty darned high. Sharron Ayers … Peoples Health Champion.